This message was preached at Word of Grace church on the 24th of Feb 2013 by Colin D Cruz. You can listen of download the mp3 by clicking here. A vision with no nuts and bolts is like all the beautiful pieces of a car not having been put together so as to function as a car . It will just be pieces that go no where. What is better than raising the dead? Last week we went through the first 4 biblical values we hold dear viz. Private worship, Public worship, giving and small groups. At first I thought I would do the balance 4 today, then I felt maybe 2 but then I felt the Holy Spirit prompt me to do just one. So we will look at the 5th one today. 1 Cor.13 says love is the highest and the grates of all. We are nothing and gain nothing if we do not have love. 1Jn 4:4 says that God is love. Why is this important? It’s not God loves us but God IS love. It is his very nature. Jn 13:34-35 the test and proof that you are truly a disciple is that you love one another. Your gifts don’t mark you as a disciple of Jesus, your love does. 1Jn 3:11, 1 Jn 4:20 you cannot love God and hate your brother. Love is important because God is love and it’s a proof that we are his disciples. God loves us not because we are good but because He is love. We find some people difficult to love because they have faults, just like you and me. People let you down, people sometimes only take and do not give. Jn 5:12 Love each other as I have loved you. How did Jesus love you? Rom 5:8 gives us the standard of Jesus love – He laid down His life for us. We need to love people in spite of their weaknesses. How do we demonstrate unconditional love? Word of Grace is good at loving people. But let us remind ourselves of a few ways we can express love. Here are some ways. 1. Greet warmly- we need to love and lay down our lives. We need to take the initiative in greeting people. Greet warmly in culturally appropriate ways. 2. Showing love – “smile, it improves your face value!”the no.1 disease in the world today is loneliness. We need to demonstrate love by having open homes. 3. Eating together- hospitality is a great way of demonstrating love. 4. Sick- visit the sick lay hands on them and pray for them. It’s a great way to express love. 5. Remembering birthdays and anniversaries. Wish them and pray for them. 6. Serving people in whatever way possible. See where there is a need- don’t wait to be asked. 7. Partnering in God’s work – working together to reach the lost. 8. Having fun times – Living life together. WE need to engage with the Church and the world in fun things. We are supposed to have life to the full. 9. Love is being gentle with one another – we respect and give honour where it is due. Teach our children to greet people. 10.Loves also means correction- but this should be done in gentleness “Teach, admonish one another” this can happen when the relationships matures. 11.Teaching the word of God. 12.We express that we miss someone. Find out why someone has not come to church and express concern and love. 13.Affirm and appreciate one another. Every morning there is a team that works hard at set up- lets appreciate them. Think of whom you can affirm. Part of our vision is that each one grows in loving one another. Will you be a more loving person? Rom 5:5 is how this happens. As we worshiped his love has been poured out into our hearts- lets take it and give it to the hungry and thirsty world out there ! Amen! 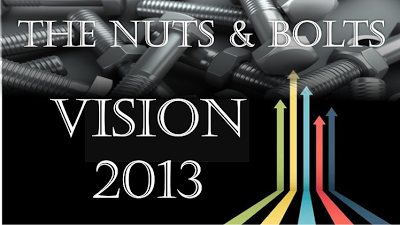 Our vision for 2013 is that God is glorified. How does this happen? This happens when people come to know Jesus- God’s glory comes on these people and it spreads and fills the earth. That is our vision – but knowing it is not enough. WE need to do it. Our aim is 30 groups that will in turn multiply. But it’s not enough to know the destination; we need to prepare for it adequately. The IPL is at hand. The cricketers are preparing for it. What are they doing? They are going through all kinds of training; they are mastering the basic strokes. In the same way we need to master some basic strokes. There are 8 things we need to do individually and corporately. 1 Personal worship – Mk1:35 “very early… while it was still dark” Jesus set the example. 1Cor 1:9 “called you into fellowship” Following Jesus is about having a relation with him. This is a non negotiable foundation. We need to spend time with God on a daily basis with Him. Acts 19:13 the 7 brothers of Sceva did not have a relationship with Jesus. Maintaining a Journal during your quiet time is helpful. Write down your prayer needs and see them being answered one by one. You can record your walk with God. 2. Public Worship Our Christian faith is a personal faith. I cannot rely on the faith of my parents. But it is not a private faith either. God is our father and the other Christians our brothers and sisters. 1Pet 2:5 “built into a spiritual house..” We come together to offer spiritual sacrifices to the Lord. Acts 2:46 they met together Heb 10:25 Let us not give up meeting together. 3. Giving – In the Old Testament the Jews gave a tithe i.e Ten percent. In the New Testament it’s not mentioned as a tithe though Jesus upheld the tithe. In the New Testament it’s about sacrificial, generous giving. Acts 4:34 there were no needy persons. 1Cor 16:2 what was the tithe used for? It is used to pay salaries, hire of facilities, buying equipment and funding mission/church plants. As I have said before, the tithe largely should go to the local church where you are being fed. You don't eat at Pizza Hut and pay at Mc Donalds, do you? In the same way the lions share of the tithe should go to the church you are now attending. And by all means bless other Christian work and mission. In the New Testament it says we should give regularly and proportionately. 1 Cor. 9:14. PJ Smyth says In the O. T you were expected to give 10% in the N. T it is grace. There is a great promise – as we sow, we will reap generously. The early Christians met in the temple courts and in people’s homes. Acts 2:46 Paul’s letters were addressed to the Churches that met in people’s home. The large gathering is great but it’s the small groups that allows for heart to heart fellowship. In order to go forward in the vision we need to connect together – to fellowship, to study God’s word together, share your needs, prayer for each other. As you do this you will see God beginning to use you and you will flourish. Let’s bring glory to Jesus. He has made it simple for us. As we follow through, with this life will become fruitful. Joyce, Austin, Lysaya are meeting with their friends in a park and sharing the gospel. They have started putting the vision into practice. As we do these 4 things we will see much success in our spiritual life. We will look at the other 4 the next week. Part 3 - The call and the challenge. This message was preached by Colin D' Cruz at Word of Grace Church on the 10th of Feb2013. You can listen / download the audio file by clicking here. This story is about Lazarus. He had two sister Martha and Mary who were good friends of Jesus. Lazarus fell very ill while Jesus was away in another town. They sent word to Jesus about Lazarus’s condition because they knew that Jesus had healed many people from all kinds of disease. Jesus got the message in time but did not do anything about it, in fact he chose to stay there a little while longer. One would think that this is such a strange response (verse4-6) Imagine if you call a doctor in an emergency and he deliberately delays his coming to you. What we must remember is that Jesus did not do anything outside of God’s will. Then Jesus comes to Martha and Mary’s house and he is greeted by a funeral party. Lazarus had been buried 4 days. The Jews believed that the soul stayed on the body for 3 days and on the 4th day it left the body. It was now the fourth day and the body should have decayed really badly. This is when Jesus arrives. V22 Martha expressed hope though she is disappointed. You may have dead situations viz. a job, finance, relationships etc that seem hopeless top the point of decay. V25- Jesus says “I am the resurrection and the life” Jesus takes them to the grave. V 38 They come to the tomb and asks that the stone be rolled away. V 43 Jesus commands the dead Lazarus to come out. This is not a fairy tale. This is history. 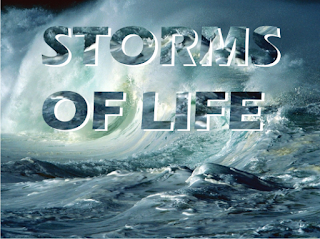 Throughout Jesus ‘ministry he demonstrates that he is God over creation (when he calms the storms), over food (the 5 loaves and two fish), over sickness and death. Jesus goes on to say in 12:24 unless a grain of wheat falls to the ground and dies it will not bear fruit. Jesus though Lord of creation knew what He had to do. This is the way He modeled and taught it. We know we are going to heaven because he died and paid the price. Jesus is saying he is the kernel of wheat that is going to die. He knew going to the cross would produce a great harvest and rose again and the gospel has gone on for 2000+ years. Verse 25 – It does not end with Jesus. Jesus is asking for a response. Are we willing to loose our lives for him? We need to have a new way of living. How can we bless and serve others. When you do this it will be inconvenient. It will involve hardships, pain. We get many opportunities to deny ourselves and practice this. This world is quickly passing by. What will we do with our time on earth? It’s only a short blip in eternity. There is a great hope in eternity. Jesus set the example. It will cost us – our comforts and preferences. The people you reach with the gospel will keep growing because of the seed you have sown. Churches die due to stagnation. We can be comfortable with certain things. But the new wineskin is Church Planting Movements- where you are starting new groups. Start one, don’t stagnate. This message was preached by Micahel Eaton at Word of Grace Church. You can listen or download the audio message by clicking here. This is the last miracle of Jesus. There is a connection between this and Luke 5 at the lake of Gennesareth where they fished all night and caught nothing and then they put down their nets at Jesus’ command. Jesus said to Peter he would catch men. On both occasions Simon was involved, they failed to catch all night, they catch a huge quantity. Luke 5- it’s a call narrative. It is a call of Peter to be an apostle. In Mark Jesus says, “Come follow me”. Luke has this story instead (Luke leaves the Matthew- Mark stay out) which is similar. It is a parable about ministry. The sea depicts the human sinfulness. Peter goes out into the rough sea- catching fish/people for God to save them. Peter will be a key person in bringing people till James the Lord’s brother takes over. 3000 get saved on the day of Pentecost- very successful for God. Peter did not want it either-he thought himself as very sinful. Jesus did not take the slightest notice. He knows we aren’t, we’re sinful. Jesus does not deny it, He ignores it. You are not called because you are good. It is all grace- your salvation, your calling, your marriage, etc. when the Lord says ‘well done good and faithful servant’ you might argue there saying ‘well done good and faithful savior’. Even the reward we’ll get is grace. Jesus gives them this overwhelming catch- a picture of the day of Pentecost- the amazing conversion of 3000. John 21 is a repetition of the same miracle, only it is 3 years later. Peter has here indeed been a sinful man- its 48 hours after Peter denied Jesus, where he cursed and swears that he doesn’t know Jesus. Jesus had warned him that Satan would try to sift you but Jesus prayed that his faith would not fail i.e. we would never cease to believe. A backslider is saved because he knows the gospel is true, not a pretender or false Christian. Peter did not stop believing. That’s why he breaks down and cries. So in John 21 he has sinned- let the Lord down badly. If anyone should be dismissed from ministry it should be Peter. But 6 weeks later he is leading 3000 to repentance at the day of Pentecost. What Jesus does is he does the same miracle all over again. Jesus is recalling Peter into ministry. Your ministry is not going to be taken away from you even when you are weak. It takes extreme rebellion for your ministry to be taken away. E.g. : King Saul. Even then, Saul did not lose his salvation. He was just not to be king anymore. He lost his kingship not salvation. When Israel lost (Numbers 14) because they rebelled 10 times, they were not taken back to Egypt-they did not lose what they had got but they lost what they could have had- their inheritance. Even that is rare (Hebrews 6). Peter even though he cursed and swore- we can be harder on ourselves than God is (Hebrews 4). As long as you can hear His voice, Him challenging you, grip you- you will be O.K. He has not given up on us at all. Q. When Israel was in the wilderness- did God give up on them? The best generation was the Joshua generation (Jeremiah 2). How did they come to be? I believe their parents taught them even though they would miss out. Numbers 14- God said, ‘I have forgiven them’. Even if you lose one ministry, God will give you another. Peter does not want to answer Jesus’ questions. Jesus asks him, ‘do you love me?’ 3 times because Peter denies Him thrice. 3 times, Jesus restores him. He had not lost his call to be an apostle. Peter’s ministry is to tend the sheep- there will be 3000 new converts. The amazing thing about God’s grace is God works all things together for good (Romans 8:28). It is so good you can hardly believe it. Does this include the bad things and the sins- yes! The good things are good. It is the bad that needs to be made good. E.g. : Jonah. Have you sinned that it resulted in so much good? Jonah- the sailors on the boat to Tarshish get saved through his running away. God can over-rule what you have done but should not have done. When you go through the experience of falling it humbles you- you are sympathetic with the sinner and not be like a Pharisee. Though it is not a good way of learning mistakes but it is for your humbling. If you have a doubt- look at the cross. Wicked men were used to crucify Him. They are there on the day of Pentecost. What they did in wickedness is for the salvation of the world. God does not make sin happen but He can control it to fulfill His purpose- “You meant it for evil, but God worked it out for good.” God works all things for our good. You may say, “It does not matter what I do, God will over-rule it”. Yes, but God will take His time. It may take a long time because there will be a lot of pain and suffering. It may take time, so don’t misuse it. All things for good- the condition being that you love God. So what does the Lord want me to do now? Confess your sin and hand your troubles, mistakes to Him. Samuel tells them they should not have chosen a King but now if they would obey God, the Lord will bless you. The principle is that you start from where you are- that’s how we live every day. Every day we start from zero (though you have learnt a few things) in terms of your position- Phil 3. That’s where Peter is- a sinful man- he fell but God ignored his guilt then and now. Jesus did not even raise the subject but re-commissioned him. A new start- that is where we all are every day. One of the great secrets of the Christian life is not to depend on yesterday’s experience. Go to God for fresh grace every day and you live that way. If you don’t live that way the Lord may let you fall and show you something- how weak you are. Take it that you are weak and need Him every day. Grace is the most amazing thing that you could ever imagine. Storm of life - Does Jesus Care? This message was preached at Word of Grace Church, Pune, By Lav Samuel on the 3rd of Feb 2013. You can listen/download the audio mp3 by clicking here. The storms come and they can come suddenly. This happens to Christians and others alike. It’s for these occasions that Jesus prepares us. We may know the Bible but in life we often forget what we have read or what we have heard in the Word of God. Jesus is now in the boat in a storm. This is particle training time for the disciples. Some storms come with warning but some come unannounced. The same story is in Matt 8. The waves broke over a boat. The disciples were with Jesus in the boat and they were fishermen who understood changes in weather. Job sudden storms calm in the life of God fearing men. Everything was OK but then suddenly a storm broke out. It may be health, jobs, and relationships. Suddenly a marriage breaks down. But we have an answer in the Word of God. Let’s not live in cuckoo land Satan tries hard to rock our boat. What was the disciple’s reaction? 1. They panicked – fear came. They forgot Jesus’ teaching. Fear destroys faith and develops into doubt. Fear is a strong weapon of the enemy. In Job 3:25 “What I have feared has happened” Satan takes a grip of what we fear. God will not remove his hedge of protection around us, only we can give way and allow Satan to have a foot hold when we give way to fear. 2. They looked at Jesus- this is the only thing they did right, Jesus was asleep in the boat. Today if our boat is being rocked, he is not bothered because He is the creator. HE overcame everything. He said it is finished on the cross. He is aware of what is happening. 3. They blamed Jesus. Surprised? “Do you care?”He does care for us! They did not wake him up to calm the storm ( v.41). They woke hi m up to blame him. Even older Christians doubt when in trouble. 4. Luke 10:38-41 “Don’t you care?” God cares for us He loves us so much that he came down to earth. How bad must he feel when we blame him and tell him that He does not care. How sad it is when we do this? 5. We should be like Job – he did not sin by charging God for any wrong but he fell down and worshiped God. Why did the disciples react the way they did? They forgot his presence – When God is for us who can be against us? They forgot his promise – Jesus said lets go to the other side. Today he is promising that to his people. It’s an invitation to come over to the other side. The hope that you and I have is tremendous – our last breath on earth shall be the first in heaven. The Word of God is applicable today for each one of us. Promises of God work out in different ways. Jesus gave the storm an order- “ Be still” Storms have “eyes and ears”! Afraid?” Jesus is with us. Don’t be so afraid. Jesus did not give up on them. Jesus believed in them. He still believes in us. That’s the love of God for us. Our faith should be strong. Faith without deeds is dead. Joshua – walking around Jericho 7 times. But Joshua had faith in god because God had said so, it will happen. If we have faith it will come to pass. What are the faith evidence in your life? Share it with others to build their faith.